I decided to start composting using worms to speed things up and reduce the smell and flies, and I wanted to start with a controlled environment so I chose to start with an indoor worm farm, aka vermiculture. First I ordered the worm “house”, then I was looking at purchasing worms online. I was planning on purchasing the “Uncle Jims” brand worms, but then I found the Arizona Worm Farm about a half an hour from my house. I planned a trip after getting my vermi-hut (so I would have a place to put the worms when I brought them home) and took a couple of my kids with me to get them. 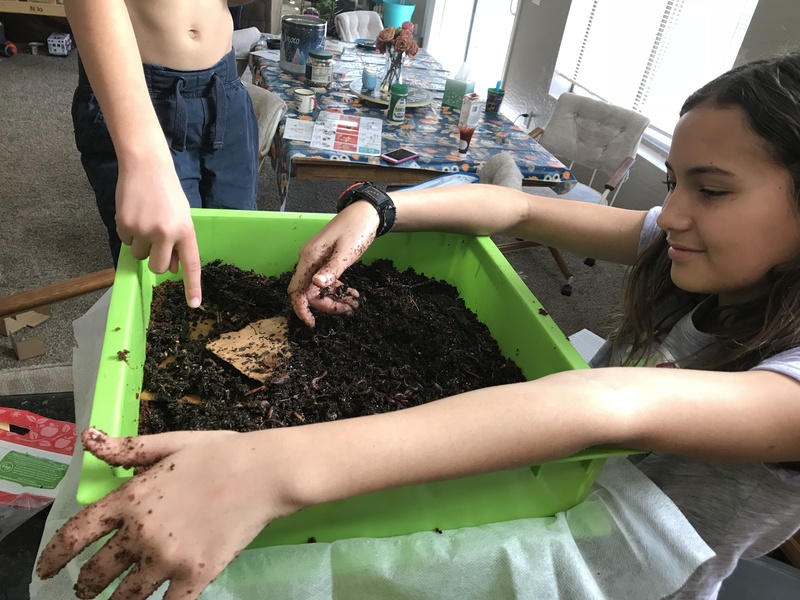 After bringing home the worms, I setup the worm “house” and soaked the coco-core which came with it in water, then my kids took over and it was the best I could do to keep up with them while reading the directions in the provided manual that came with the VermiHut. My kids took over the setup of our new VermiHut.